A Whimbrel left its roost in Burniston Bay this morning and flew to the field west of Fields Farm. A Great White Egret and a Barn Owl were seen at Wykeham South Lake, and a Great Northern Diver was seen just off the harbour. A ring-tailed Hen Harrier was spotted flying west over Cayton Carr late morning. There were a pair of Stonechats on the cliffs at the south end of Jackson's Bay this afternoon, and 12 Curlew were in the fields at Cromer Point. 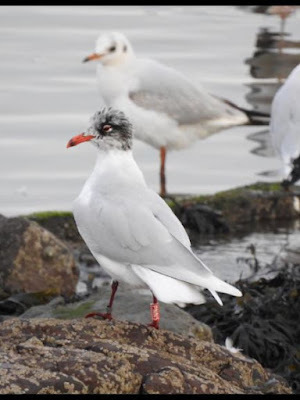 6 Reed Buntings, 3 Yellowhammers, and a Common Snipe were seen in the Scalby Lodge area, and at Scalby Mills the red ringed Mediterranean Gull that has wintered each year in Scarborough since being ringed in Poland in 2013.